I can't quite put my finger on it, but I do not like this outfit. The cut or the fitting, perhaps the fabric or colours... I don't know but... no. No for me too, and besides, that dress doesn't fit her well and doesn't suit her. Red and sparkly--so why do I not like this dress? It seems shapeless somehow. 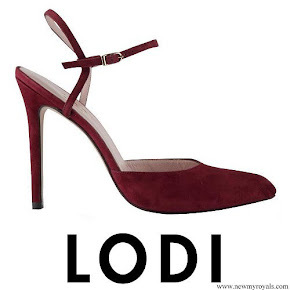 I love the shoes, though. As for the lady behind them in the last photo who appears to be dressed in the Spanish flag....words fail me. Hahaha, and did you notice that woman's shoes? This is Ágatha Ruiz de la Prada y Sentmenat. She is a Spanish noble and fashion designer. She is the most original dress designer and creator in recent years. Her bold and colourful designs have made her one the most acclaimed fashion designers in the national and international scene. Agata Ruiz de la Prada is a very successful Spanish fashion designer, well-known for her colourful designs. I think she looks fabulous. She is Agatha Ruiz de la Prada, a very famous Spanish designer. Thank you. I had never heard of her but will look out for her designs in future. Not a bad looking dress, but I feel it makes Letizia appear older, OMO. As I read the comments before me, I don't care for the look, either. Right away, all I could think of is, "It is depressing." Color, shape, length, too many sparkles - not too good this time. I did not like this dress on her at all. It made her look frumpy, and that's not a word I'd use to associate with Queen Letizia. Her hair wasn't the greatest either but I did like her shoes. Agree about the shoes. And indeed, the dress simply doesn't work for her. I spent quite a while looking at the pictures trying to figure out what was bothering me about this dress. I don't know exactly. It looks like a lot of dress for her small frame, and the belt seems too close to her breast for having such a deep "V". I think the lurex makes it more dress than it has to be. I do like her choice of shoes over the model's. It is not a belt, it is a "fajín" in Spanish and very typical here even for brides. I don’t care for the sloppy neckline; looks poorly fitted. I liked the dress the first time, and still do. Very boho chic, and splendid colors, good choice of shoes. Hair and makeup great asusual. AnnieM, the lady you are referring is Agata Ruiz De La Prada, one of the most famous designers in Spain, she is well known for her rather unique fashion. Totally agree with you Cherry Blossom. I like it too. Ib this boho chic style she looks young and relaxed. Agree, Cherry Blossom. I find the fabric very beautiful and unusual. Earrings echo the lines. And love the shoes. I don't like the belt at all, the dress looks too big and too long, her posture is pretty awkward. Not a good look. A rare miss from Letizia IMO. The waist section sits strangely under the bosom and gives the whole dress a frumpy air. Better fitting would have made this totally different. Me encanta el vestido colorido y alegre para esta primavera que tenemis ya en España. Ya estábamos hartos de tanto color oscuro, España es color y luz. 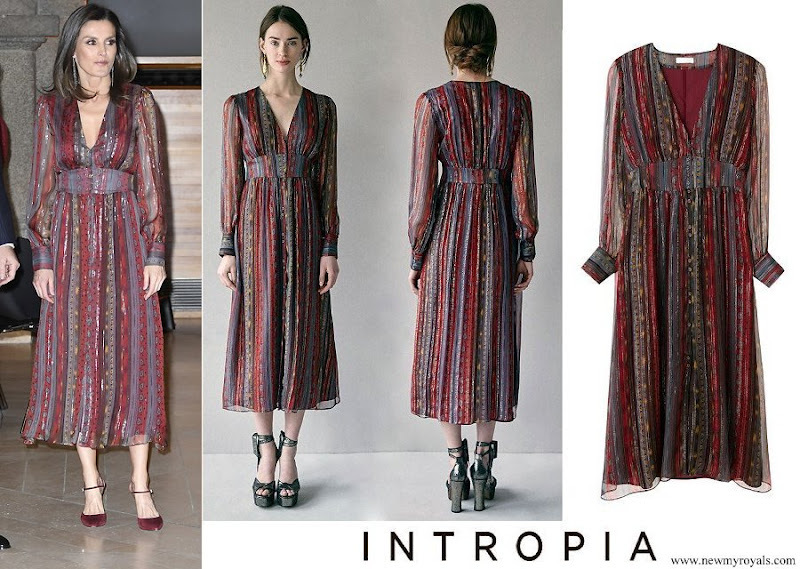 Intropia, another Spanish brand, as always the Queen with the Spanish fashion. 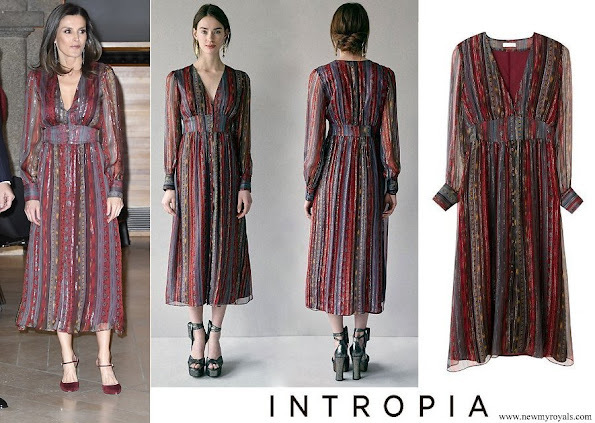 Perfect dress for spring and for those kind of awards. Spanish fashion as well. I like this dress, it's not my favorite but i really like it, hairdo and jewels are also very nice, I would just change the shoes, but to be honest I don't know for which one's but I prefer these ones than the ones she used on Peru. On general, for me, she looks very well. 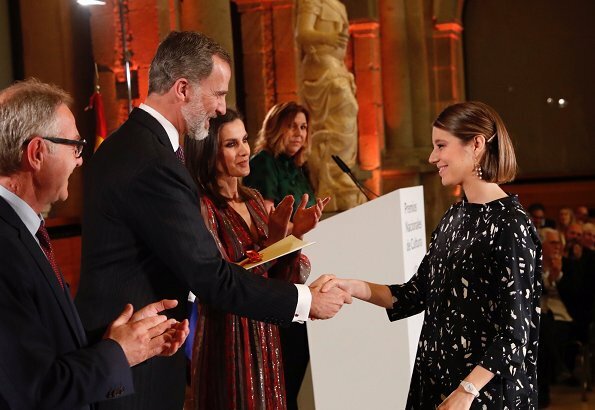 Letizia está guapa y sencilla. I think the Queen is underdressed. 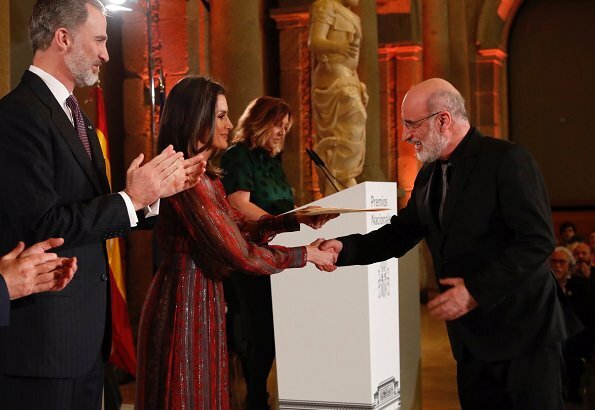 It's a nice boho chic dress for a summer dinner with friends, but not for this event: the delivery of national culture awards in the Prado Museum. 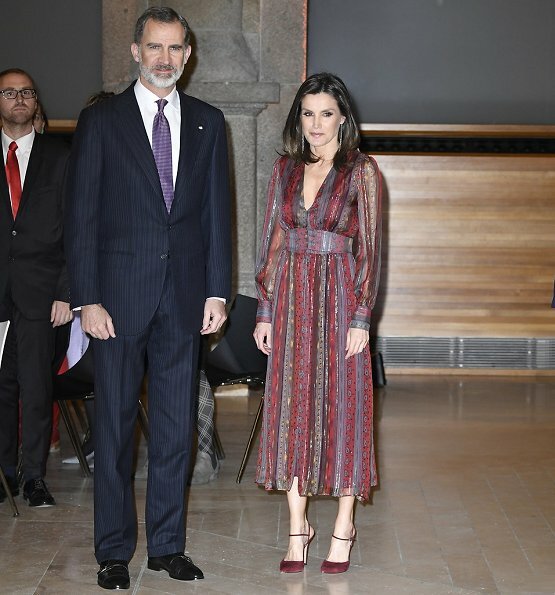 Very spanish dress and it does look good on Queen Letizia. This is youthfull and in a way classy. All in all hairdo, dress makeup on line. Great shoes! The dress - a big nooo! Precioso vestido, sencillo, alegre y festivo. Los pendientes colgantes de diamantes negros me encantan y son perfectos aquí. Letizia está encantadora. I disagree. Okay, I also don't like her stockings and her shoes. But skirt, jacket, lipstick, hair - nothing wrong with that. Why should she stand at the back of the line? She is most likely there to support one of the winners. She looks great ! And she does a good job recycling her clothes, congrats ! Letizia's dress probably looked very rich in person, but it's not photographing well. 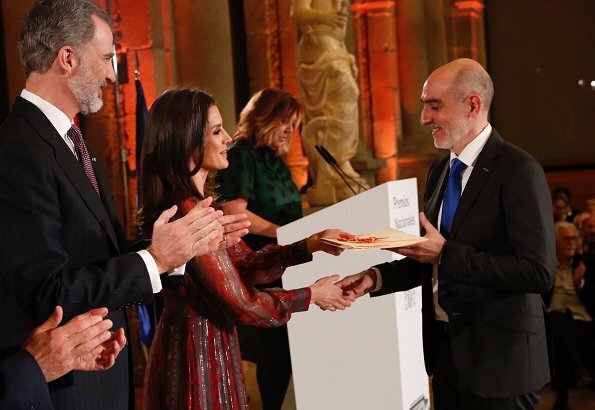 I like the dress but not for Queen Letizia. NOt her best choice, sorry.